New: the instructions for this series of work are now available to buy here. A series of work based on Cubic Right-Angle Weave components. I have long been inspired by city skylines and especially of London with its tower blocks of varying heights. I have so many memories from a young age of being driven over London's Westway and the view it affords. Tired and bored in the back of the car I would look out at grey London and love it if people had their washing out to dry on their balconies and each level was filled with colour. 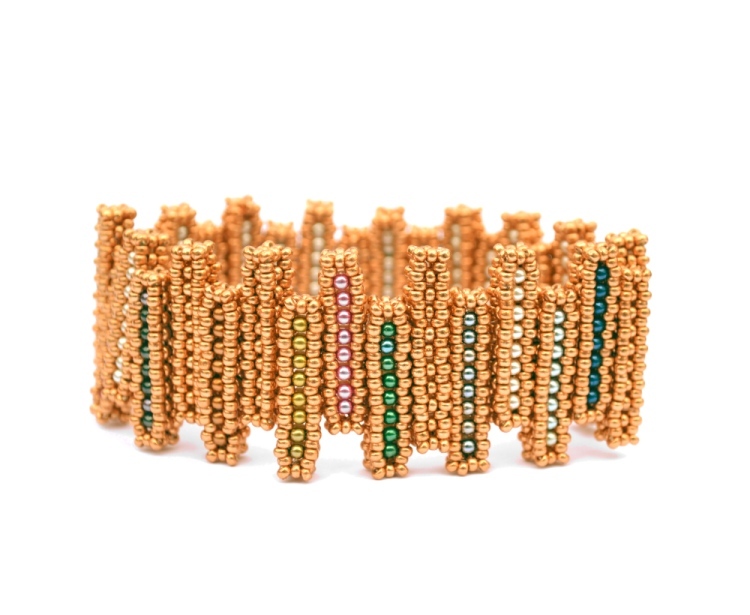 Taking that as my inspiration I designed, and have been working away for a long while, on this reversible Cubic Right-Angle Weave bracelet that incorporates different heights and colours to reflect what I would look at as a passenger for all those years. I have called the bracelet Sticks & Stones partly as it is made up of 'sticks' of beadwork using coloured 'stones' for decoration and partly because of the children's rhyme that reminds me of being a tiny passenger for all that time.